It’s an unfortunate fact that not many books are set in Canada. The majority of Canadian authors I know set their books in the States or elsewhere, so it always excites me to find a book set in Canada. I think it excites me even more when the book is set in Canada, or mentions Canada in a favourable way when the author isn’t Canadian. It irritates me to no end when I’m reading a book or watching TV and hear people making derogatory comments about my beloved home country. If they’re joking, sure I might be able to laugh along, I like a good joke as much as the next person - but when they’re being serious, it really gets under my skin. So today I wanted to spotlight three non-Canadian authors who talked about Canada in their books. 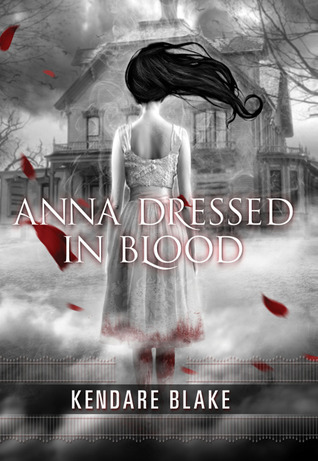 The first is Anna Dressed in Blood be Kendare Blake. I was absolutely shocked when I started reading this book and discovered it’s set in Thunder Bay, Ontario. I immediately looked up Kendare’s biography, and was surprised to find she’s not from Canada. Now, of course, I wish I had contacted her as part of Canadian Spotlight Month and asked her why she chose Thunder Bay to set this fantastic book. Not only is it a Canadian city, it’s not your typical Canadian city - books that mention Canada or are set in Canada usually spotlight a well-known city like Toronto or Ottawa or Montreal. The fact that it was set in Thunder Bay made made me enjoy the book even more. The next book is one that mentions Canada in a really cute, funny way. If you know me at all, you’ll know that Anna and the French Kiss by Stephanie Perkins is one of my favourite books. I raved and gushed about it, and still do to this day. I felt like I giggled like a school girl through most of the book, and one spot that had me particularly delighted was when St. Clair gives Anna a Canada flag pin so she’ll feel like she fits in better. Here’s the thing: when I was 17, I went to Paris on a school trip (Anna was also 17). Our group quickly discovered that Americans generally weren’t looked upon in a favourable light - I don’t mean any offense to Americans here, I love the States and I have a lot of good friends who are American, I’m just stating a fact. When we were out in groups, we could hear people mumbling about Americans, and when we told them we were Canadian, or when they saw our little Canada flag pins, they treated us better. So I thought it was hilarious and sweet and so endearing when St. Clair realized Anna was having trouble with the fact that she was sticking out as an American, so he got her a maple leaf pin to help her feel better. He hands me a yellow padded envelope from his desk, and my stomach dances like it’s my birthday. I rip the package open. A small patch falls to the floor. It’s the Canadian flag. As if I wasn’t already in love with this book (and with St. Clair) I was a complete goner after that! The next book that mentions Canada is The Single Girl’s To-Do List by Lindsey Kelk. In this book, the main character’s best friend is Canadian, and they talk about Canada throughout the story quite a bit, which was pretty cool. Then they visit Canada (Toronto and Niagara Falls specifically, two cities I’m been to countless times), but the descriptions annoyed me quite a bit. For example, when the main character said Canadians were ‘almost offensively friendly’ and ‘I couldn’t remember the last time I’d said hello to so manner strangers’ I had to wonder what part of Toronto she was in. Although Canadians are known for our friendliness and hospitality, I’ve spent a lot of time in Toronto, and I wouldn’t necessarily say it was full of friendly people. More the type of people who keep their heads down or stare straight ahead, ignoring everyone around them. Or glare at you and look like they want to stab you and steal your wallet. Then she said that there was maple syrup in everything - such a cliché, and an untrue one at that. She made it sound like it was in literally everything on the menu. I very rarely - if ever - see maple syrup in anything, and I live here. And you know why you rarely see it? Because it costs more than gold! We may make it here, but it’s ridiculously expensive. It just seemed like she stuck together the most clichéd things she could come up with and threw them in for good measure. I know these things may seem random and petty to most people, but I’m sure if you stop and think, you can come up with clichés about your own country that drive you nuts, or that you find offensive. So there you have it, three non-Canadian authors who talk about Canada in their books. Have you ever read a book that talked about your country in a nasty or cliché way? Do you live in a foreign country where it's rare to read a book set in your native land? Are you a fellow Canadian who gets excited when you discover a book that's either set here or mentions Canada? Awesome books! I love it when a book is written by a non-Canadian but is set in Canada! Anna and the French Kiss is one of my favourites ... I've heard of people putting Canadian paraphernalia on their person when traveling through Europe! I have a copy of The Single Girls To-Do List ... it looks super good! And I've heard great things about Lindsey Kelk. I also just recently read Anna and the French Kiss and I loved the part where Etienne gives Anna the Canada flag pin - so cute. Haha, and with The Single Girls To Do List I totally see what you mean. Toronto is probably one of our least sterotypically friendly cities! No one looks each other in the eye, holds the door, or apologizes for bumping into each other. That's more smaller town behaviour I think. Oh, and yes, maple syrup isn't on everything!